Quddūs is an aggrandizement of the root word q-d-s (ق-د-س), and can mean ‘pure’, ‘holy’ or ‘blessed’. It tells us that God Almighty is pure from any defect and purified from anything blameworthy. Another meaning of Quddūs is that God Almighty purifies the hearts and souls of His worshippers, but what God Almighty Himself is purified from may be something that is necessary for humans. A person who does not sleep is an insomniac and most likely needs treatment. With God Almighty, His non-sleep shows His self-sufficiency. 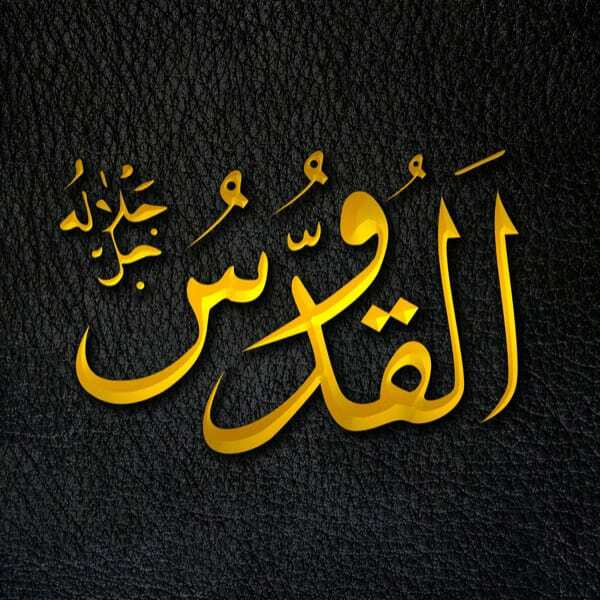 And according to Imam Al-Qurtubi, the name Al-Quddūs also describes the One who is glorified and revered by the angels. As Ibn Al-Qayyim reminds us, Al-Quddūs is too pure and holy to ever act with oppression. This is important to keep in mind and comprehend, so that we do not attribute blameworthy human attributes to God Almighty. Sheikh Abdulrazzaq Al-Badr shows that the Name Al-Quddūs comes with the Name Al-Malik in the Qur’an, which means the Sovereign or King. When people hear that God is King, that could be a neutral attribute, or it could even be a negative one if they have had bad experiences with oppressive kings. Hence, God Almighty tells us that He is “Al-Malik Al-Quddūs”, reminding us not to get confused. He is the King, but He is Pure and so He acts with ultimate justice. There is no oppression under Him.